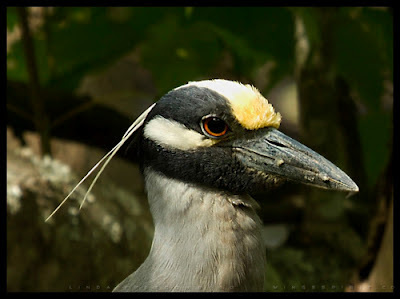 If you like going to beach, lake or jogging in your local park, which happens to have swamp or a river run through it, heron will not be a total stranger to you. I'm very embarrassed to tell you that I really did not pay much attention to these beautiful birds until I went to my first field trip with my fellow master birders. I remembered at the end of that field trip, everyone was walking towards parking lot, my trip leader ran towards me and told me "Linda, come with me...please hurry!" I had no idea what he wanted to show me. As I followed him back to a small pond, this gigantic bird swooped from sky like a huge bomber jet. The only difference was this bird was a quiet flyer. "A Great-Blue Heron! ", I yelled vehemently. The trip leader smiled and he fulfilled my dream of seeing my first ever, also the biggest heron in North America. I'm blessed to live in a state warm and humid enough to see all six species of North American herons. They are abundant in the coastal region, feed and breed at fresh or salt water marshes, shallow bay, river, lake, inlet, swamp or near mudflats. 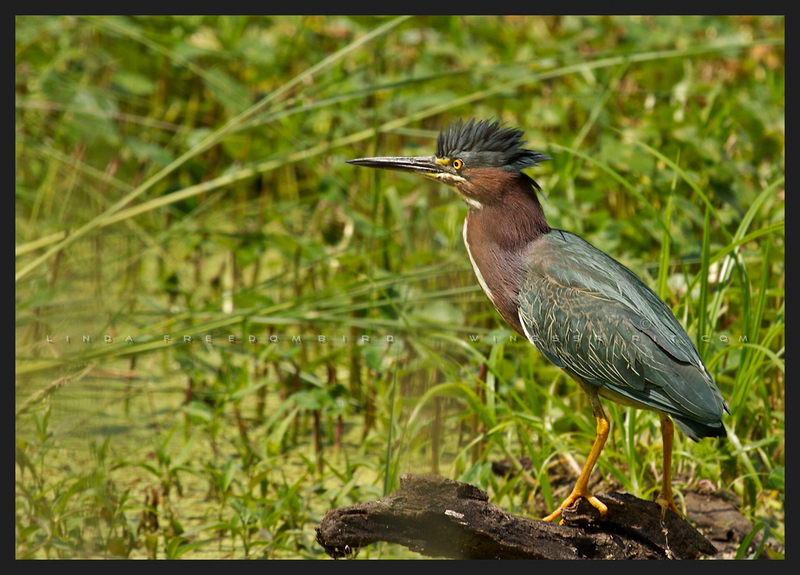 Though their body size ranging from 16 inches (such as Green Heron) to over 4 feet tall (such as Great Blue Heron), they have evolved and adapted to be one of the smartest birds. Often time, herons stand still and wait at the bank for prey to come by. 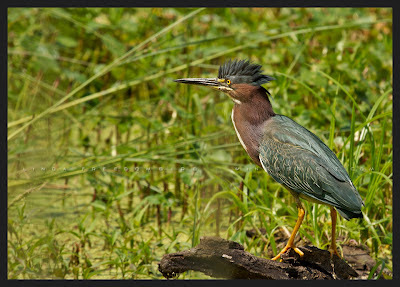 Interestingly, Green Heron will sometimes use bait such as bread, popcorn, flowers or twigs to lure fish; Great Blue Heron's long, S-shaped neck can strike prey at a distance; Little Blue Heron stays white plumage for the first year and they often mix with Snowy Egrets to gain protection and catch more fish; night herons are generally nocturnal, hide and roost daytime and hunt at night, however they will feed during the day while carrying young.